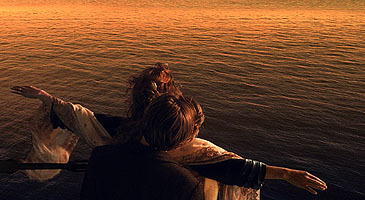 In this breathtaking sequence, Jack teaches Rose how to 'fly'. 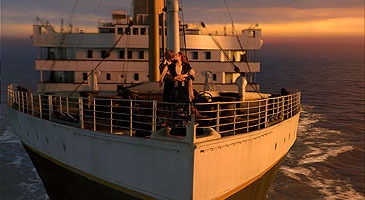 For each of these shots, Leonardo DiCaprio and Kate Winslet were shot motion control against a greenscreen, with the camera move matching in scale the sweeping move made on the 1/20 scale miniature Titanic. 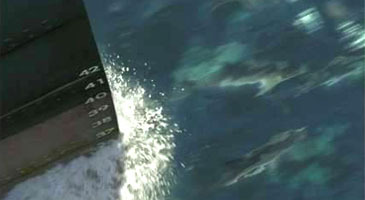 For all wide shots of the ship, digital water was created with Arete software, and was combined with digitally mapped real-life wake and splash elements. This is just one of the film's magnificent camera flybys of the ill-fated cruiser. In this 'helicopter' shot, the camera flies across the bow, focusing on a few crewmembers walking the decks, as the view rotates about 90 degrees, ending on the ship's captain. This shot contains no full-size, live-action elements. The ship element is one of many highly intricate miniature models shot at Digital Domain. The people on the ship are actually CG models - extremely detailed models, animated by DD's motion capture system, and locked into the frame by DD's 3D tracking team. 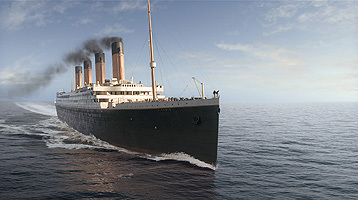 The digital effects team created digital matte paintings for the sky, CG birds, water and wake as well as digital smoke from the smokestacks. Jack Dawson and his buddy reach the very front of the ship in this wondrous shot by Digital Domain. The camera arcs from this position, all the way above Jack's head, looking straight down into the sea smashing into Titanic's stern. 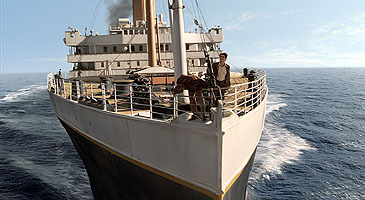 The ship miniature was shot motion control, with the actors were shot against a greenscreen with a matching and scaled camera move. The top image of the speeding ship sailing through the water is a LightMatters composite of Digital Domain elements. While at sea (bottom image), a group of dolphins swim with the craft, bouncing in and out of the water. 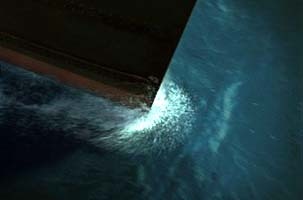 The dynamic sequence was completed by Hammerhead Productions compositing real dolphin footage into shots of Titanic at sea, as well as with computer generated dolphins for some tight shots. For this particular shot, Hammerhead created CG dolphins to move in the precise way that director Cameron wished.